by Chris Woodford. Last updated: June 9, 2018. Once upon a time, if you'd seen a mouse in your room you might have screamed and jumped up on the desk. Today, the mouse has jumped on your desk instead: it's the handy little pointer that makes your computer easy to use. The first mouse was made of wood and designed over four decades ago in 1961. Today, mice sell by the million and hardly a computer ships without one. They've changed quite a bit in that time but they still work in much the same way. Let's take a look inside! Photo: The computer mouse is an amazingly ergonomic little gadget that bridges the gulf between person and machine; technically, it's an example of what's called an HID (Human Interface Device). Choose your mouse carefully and don't be afraid to spend money on it: you'll probably be holding this thing for several hours a day for quite a few years, so it's worth the investment! A mouse is something you push along your desktop to make a cursor (pointing device) move on your screen. So what a mouse has to do is figure out how much you're moving your hand and in which direction. There are two main kinds of mice and they do this job in two different ways, either using a rolling rubber ball (in a ball-type mouse) or by bouncing a light off your desk (in an optical mouse). Traditional mice have a rubber ball inside them. Open one up and you can see the heavy ball clearly and the spring that keeps it in position. Switch detects clicks of left mouse button. Old-style connection to PS/2 socket on computer. Chip turns back-and-forth (analog) mouse movements into numeric (digital) signals computer can understand. X-axis wheel turns when you move mouse left and right. Y-axis wheel turns when you move mouse up and down. Spring presses rubber ball firmly against X- and Y-axis wheels so they register movements properly. How does a mouse like this actually work? As you move it across your desk, the ball rolls under its own weight and pushes against two plastic rollers linked to thin wheels (numbered 6 and 7 in the photo). One of the wheels detects movements in an up-and-down direction (like the y-axis on graph/chart paper); the other detects side-to-side movements (like the x-axis on graph paper). How do the wheels measure your hand movements? As you move the mouse, the ball moves the rollers that turn one or both of the wheels. If you move the mouse straight up, only the y-axis wheel turns; if you move to the right, only the x-axis wheel turns. And if you move the mouse at an angle, the ball turns both wheels at once. Now here's the clever bit. Each wheel is made up of plastic spokes and, as it turns, the spokes repeatedly break a light beam. The more the wheel turns, the more times the beam is broken. So counting the number of times the beam is broken is a way of precisely measuring how far the wheel has turned and how far you've pushed the mouse. 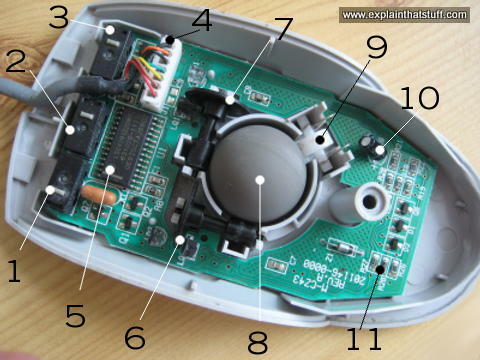 The counting and measuring is done by the microchip inside the mouse, which sends details down the cable to your computer. Software in your computer moves the cursor on your screen by a corresponding amount. Photo: A ball mouse detects movements by using a wheel with spokes to break a light beam. On one side of the wheel, there's an LED (light emitter) that generates an infrared beam. On the other side, there's a photoelectric cell (light detector) that receives the beam. As the heavy rubber ball moves, it makes the wheel turn, so its spokes break the beam. This generates a sequence of pulses that can be used to measure how much the mouse has moved. But how do we know which direction it's moved in? There are, in fact, two emitters and two detectors side by side. As the spoked wheel rotates, it partly blocks one emitter-detector beam as it uncovers another. By comparing the order in which the two beams are blocked and unblocked, the mouse's circuitry can figure out which way your hand is moving. You can see a bigger version of this photo on our Flickr page. For more detail of how this kind of encoding works, take a look at Apple's early 1980s mouse patent US Patent 4,464,652: Cursor control device for use with display systems. There are various problems with mice like this. They don't work on all surfaces. Ideally, you need a special mouse mat but, even if you have one, the rubber ball and its rollers gradually pick up dirt, so the x- and y-axis wheels turn erratically and make the pointer stutter across your screen. One solution is to keep taking your mouse to pieces and cleaning it; another option is to get yourself an optical mouse. Photo: An optical mouse seen from underneath. 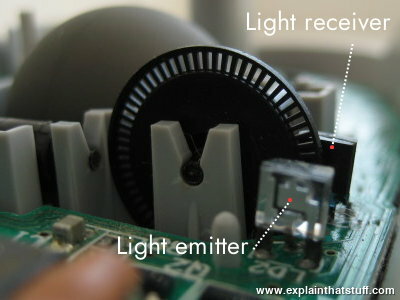 Note how the rubber ball you'd find in a ball-wheel mouse has been replaced by the photocell and LED. An optical mouse works in a completely different way. It shines a bright light down onto your desk from an LED (light-emitting diode) mounted on the bottom of the mouse. The light bounces straight back up off the desk into a photocell (photoelectric cell), also mounted under the mouse, a short distance from the LED. The photocell has a lens in front of it that magnifies the reflected light, so the mouse can respond more precisely to your hand movements. As you push the mouse around your desk, the pattern of reflected light changes, and the chip inside the mouse uses this to figure out how you're moving your hand. 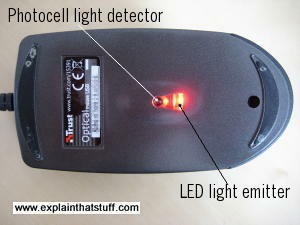 Some optical mice have two LEDs. The first one shines light down onto the desk. The light from that is picked up by the photocell. The second LED lights up a red plastic strip along the back of the mouse so you can see it's working. 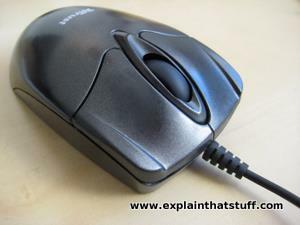 Most optical mice also have a wheel at the front so you can scroll pages on-screen much faster. You can click the wheel too, so it functions like the third (center) button on a conventional ball mouse. An optical mouse is much more hi-tech than a ball mouse. Where a ball mouse has quite a few moving parts, an optical mouse is almost entirely electronic (it has almost no moving parts). An LED at the back generates red light and shines it horizontally, from the back of the mouse toward the front (from the left to the right of this photo). A plastic light guide channels the light from the LED at an angle, down onto the desk. A light-detector chip measures light reflected back up from the desk, converting the analog movements of your hand into digital signals that can be sent to your computer. The scroll wheel at the front of the mouse is mounted on a switch mechanism that detects both how much it's rotated and whether you've pressed it (it functions like the central button of a conventional mouse). Rotations of the scroll wheel can be detected in a variety of different ways. 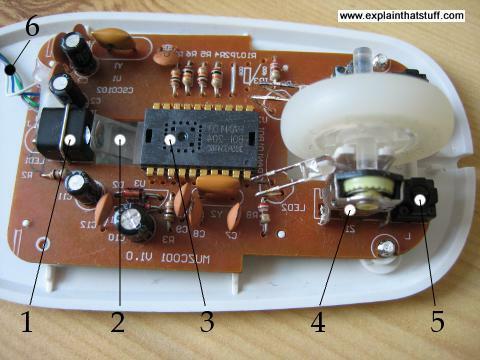 Some mice use potentiometers (broadly, variable resistors), similar to the volume control on a radio but able to turn around multiple times. Others use various kinds of rotary switches or optical (rotary) encoders to convert analog wheel movements to digital signals. A microswitch detects when you press the right mouse button. There's an identical switch on the other side to detect the left mouse button. The USB cable connection carries digital information from the mouse to your computer. Photo: The light-guide (just the right of the black chip) carries light from the LED down to your desktop. It's a bit like a prism, but it's made from lightweight plastic and there's a small lens mounted at the very end where the guide faces the LED. Chart: How long will your mouse batteries last? Rechargeables don't last as long as high-capacity, disposal alkalines, but work out cheaper in the long run. 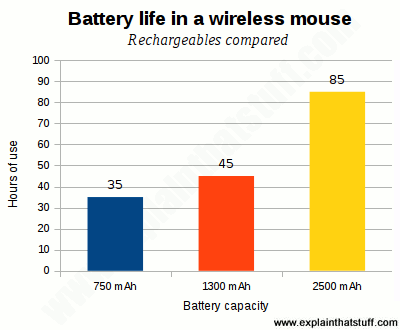 Duracell quotes battery life of 35–85 hours for its AAA rechargeables in a typical wireless mouse. There's nothing particularly special about wireless mice. They figure out your hand movements in exactly the same way, but send the data to your computer using a wireless connection (typically Bluetooth) instead of a USB cable. USB doesn't only carry data: it also provides the power for small plug-in devices like mice. Without that power, wireless mice obviously need one or more batteries (which adds a hidden running cost) and are therefore slightly heavier than wired ones (not that that matters much when they're on your desk). Bluetooth connections can be battery hogs so you might find yourself replacing your mouse batteries more often than you'd like; once every couple of months seems typical, though if you're using rechargeables, that might fall to once a week—and some mice boast battery life of 12–24 months. If you use your computer constantly, what will you do if your mouse batteries suddenly run flat? If you use rechargeables, that's going to happen more often and be more of an issue. Fortunately, some mice do have battery-level indicators or ways of warning you when the batteries are about to give out. Even so, you might prefer the reliability, cheapness, and environmentally friendliness of a wired mouse over a wireless one. For most of their history, computers were the province of scientists and mathematicians. You needed a math degree just to understand the manual and you could only tell them what to do by feeding in a stack of index cards punched with holes. All that started to change when a brilliant US computer scientist named Douglas Engelbart (1925–2013) invented the computer mouse. Engelbart realized computers were far too useful just for boffins: he could see they had the power to change people's lives. But he could also see that they needed to be much easier to use. So, during the 1960s, he pioneered most of the easy-to-use computer technologies that we now take for granted, including on-screen word processing, hypertext (the way of linking documents together used in web pages like these), windows (so you can have more than one document or program in view at a time), and video conferencing. But he's still best known for inventing the mouse, or the "X-Y Position Indicator" as it was originally known. That stuffy name was dropped when someone spotted that the cable hanging out looked just like a mouse's tail. From then on, Engelbart's invention was known simply as the "mouse". Photo: One of the diagrams from Doug Engelbart's original 1970 patent. In the top picture, you can see what looks like a very conventional computer setup; in 1970, when many computers were still programmed with punched cards, this kind of mouse-driven computer desktop was absolutely revolutionary. In the lower picture, you can see how Engelbart's mouse worked. Two wheels positioned at right angles turned when you moved the mouse with your hands. Each wheel turned a potentiometer to measure how much the mouse as a whole had moved. Brilliantly simple... and simply brilliant! Picture courtesy of US Patent and Trademark Office from X-Y Position Indicator for a Display System by Douglas Engelbart. Douglas C. Engelbart: A biography from Marc Weber posted shortly after Douglas Engelbart's death in 2013. History in Pix: A history of Douglas Engelbart's invention, from his personal website. MouseSite: An archive of Douglas Engelbart's late 1950s and 1960s research at Stanford Research Institute, including his original demonstrations of the computer mouse. Bootstrapping: Douglas Engelbart, the Augmentation of Human Intellect and the Genesis of Personal Computing by Thierry Bardini. Stanford University Press, 2000. How Douglas Engelbart's invention of the mouse ushered in the modern-age of friendly personal computers. Human Computer Interaction by Alan Dix et al. Pearson Education, 2008. Comprehensive introduction to the design of the man-machine interface. Computer Visionary Who Invented the Mouse by John Markoff. The New York Times. July 3, 2013. An obituary for Doug Engelbart and an assessment of his life's work. Encounters with HCI Pioneers by Ben Shneiderman. Interviews with towering figures from the 20th century (including Doug Engelbart) who made computers intuitively easy to use. 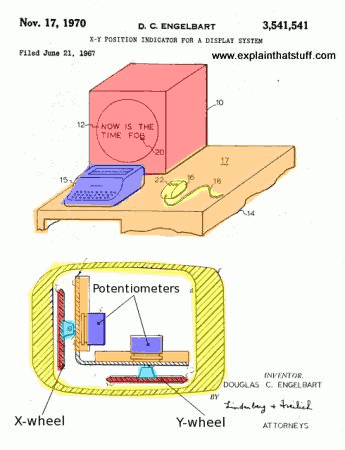 US Patent 3,541,541: X-Y Position Indicator for a Display System: Douglas Engelbart's original mouse patent, filed June 21, 1967 and granted November 17, 1970. US Patent 4,464,652: Cursor control device for use with display systems by William F. Lapson and William D. Atkinson, Apple Computer, Inc. Granted August 7, 1984. This early Apple mouse patent describes the detailed design of a classic ball mouse, like the one above. US Patent 4,886,941: Circuit for interfacing mouse input device to computer system by Hedley Davis and Robert Raible, Commodore Business Machines, Inc. Granted December 12, 1989. This one goes into some detail about how analog mouse movements are translated into digitally detectable pulses.